MOOCs, or massive online open courses, are large cohort online classes started around 2010/11 when a few Stanford professors designed a tuition-free course system which is open to virtually anyone on the web. Examples: Opencourseware like Open Yale Courses, or courses/podcast on iTunes U. We see a lot of these traits remain in the new MOOCs, where courses are offered via MOOC providers — startup companies set up to give “everyone access to the world-class education that has so far been available to a select few.” Among these providers are Coursera, edX, Canvas, Udemy, etc. Major funders: Bill and Melinda Gates Foundation, Harvard-MIT collaboration, etc. MOOCs and the Connectivist Theory: The evolving MOOC knits together education, entertainment, and social networking. Originated about 2008 within the Open Educational Resources (OER) movement, MOOCs are developed based on connectivist theory, emphasizing that learning and knowledge acquisition happen from the interactions within a network of connections. Connectivism was a new educational framework developed at the dawn of the 21st Century, explaining how people learn in a networked and digital world (George Siemens, 2005). According to Stephen Downes, connectivism is essentially the idea that knowledge is distributed across a network of connections, and therefore that learning consists of the ability to construct and traverse those networks. Students participating in MOOCs are often required to play an active role in contributing to discussions through the course forums or third-party social networks, such as Facebook groups, Twitter, or Google Plus/Hangout. Capitalizing on the opportunity of the existing wealth of interconnectivity and social networking among its students, MOOCs encourage peer-to-peer learning, reviews, and even grading, which is another hot debate in the MOOC mania. Blind leading the blind: are these students ready to evaluate others’ work? Are MOOCs appropriate for the humanities? Do students really know how to take MOOCs? What are the targeted success rates in students taking MOOCs (passing)? For online writing instruction, check out: NCTE OWI Guidelines. 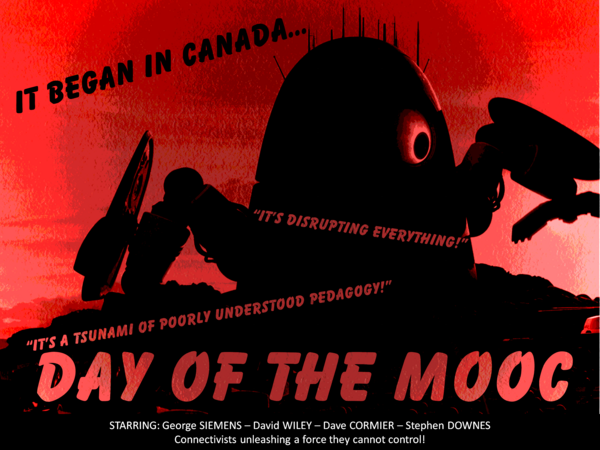 Image courtesy of David Kernohan @dkernohan, illustrating the massive destruction of MOOCs on higher education.